In a medium mixing bowl, sift together flour, baking soda, salt, pumpkin pie spice and ginger. In a large mixing bowl, using a mixer on medium speed, beat together butter, brown sugar and pumpkin until creamy - about 1-2 minutes. Beat in molasses, vanilla and egg until well combined. Reduce mixer speed to low and beat in flour mixture until combined - about 1-2 minutes. Beat in walnuts until combined. Chill dough in freezer or refrigerator for 30 minutes until cold and firm. Roll dough into balls, place on cookie sheets, and bake 10 minutes or until puffed and golden brown on the bottoms. 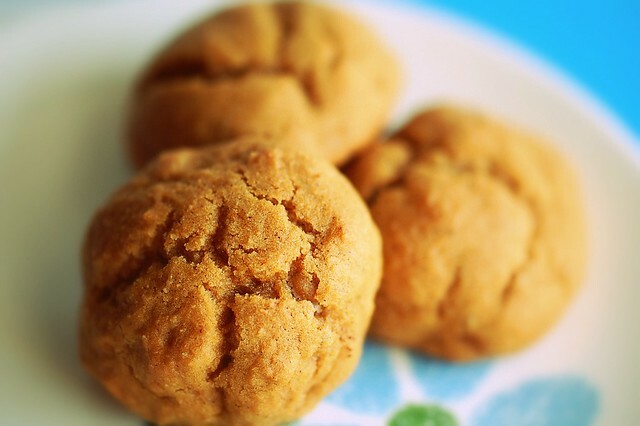 36 comments on "Pumpkin Gingersnaps"
This is cookie perfection right here. They look amazingly delicious. 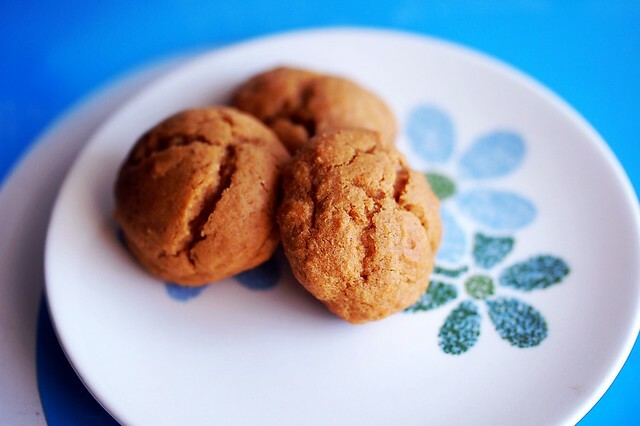 we love pumpkin cookies and gingersnap cookies so i can't wait to combine the two! great recipe! Wow. You are brilliant - these look amazing! I was planning to make chocolate chip cookies tonight, but am going to switch. Wow. These are very innovative Emily...love, love, love pumpkin this time of year!! They look like puffy little nuggets of joy! I don't know if this will help, but it's the way my blogger works. 1) Click on the Template Designer under the "Design" tab. 2) Then click on "Layout" 3) Choose the one with your desired format (i.e. one column on each side). 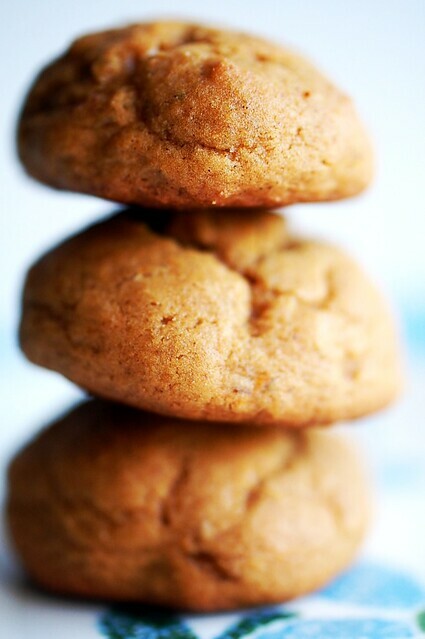 By the way, those pumpkin gingersnaps look fantastic. I've actually been looking for a pumpkin gingerbread recipe but all the ones on the web don't include molasses which to me seems an essential part of the "gingerbread" part. This recipe looks like it fits the bill. I'll have to give them a try as soon as I buy some more pumpkin. 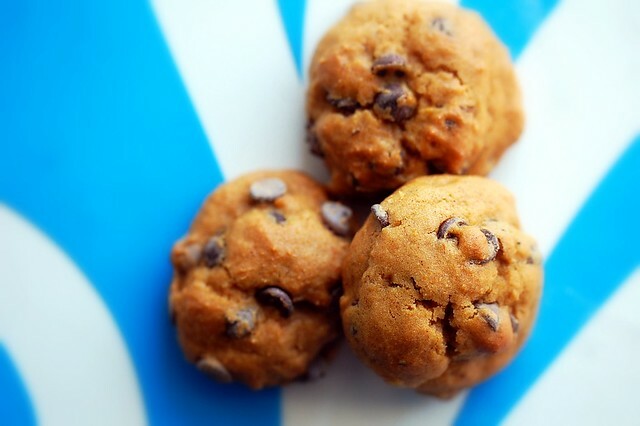 your cookies always look amazing! I can't wait to try them!! I'll let you know how it goes! Your header looks great, by the way! Very feminine, pretty, and cutesy. I loved your owls too, though. Sad to see them fly away. I wish I knew how to fix your html... for very selfish reasons. Darn, Lisa got there before I could. Well, I'll be making these cookies anyways! Thanks for the great post! I made your oreo double chocolate cookies this evening!!!! The dough is SO easy to work with!! They turned out perfectly :-) I will post about it next week!! 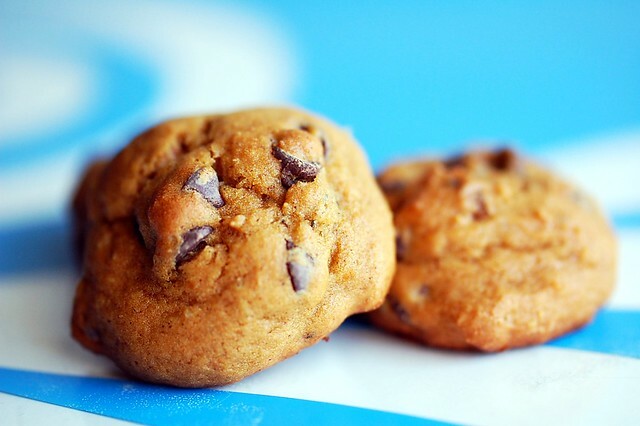 Lovly looking cookies! Yummie yummie! yum,these cookies look scrumptious, and adorable too! 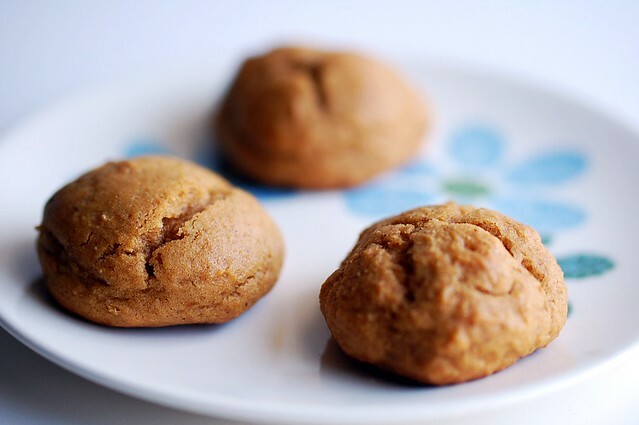 These look delicious, love love love anything with pumpkin! I love the new design! Did you do the header yourself? Everything looks neat and clean and I love the main column in the middle. Go you! I will make these, these are easy and my hubby likes pumpkin! Great job! delicious, pumpkin is my new favorite!! I made pumpkin ravioli the other day!!! SO GOOOOD. Clearly I have stalker qualities- but not in a creepy way, I promise- because I opened my People magazine and saw and ad for Cooking Channel and of course looked at it because I love all things cooking, and saw a picture, and said to myself, hey I know that person! Then I thought about it, and realized it was you! Did I miss something? Do you have a show of your own there now?? Sarah, I miss the owls too! Nadine, I don't see why not. Do you have butternut squash? That would work. Anon, whaaat?? I definitely don't have a cooking show on the Cooking Channel. Are you thinking of Bridget? I love pumpkin and I love ginger. I will for sure be trying these out!! Thanks for the post! So cute! These sound totally addictive. These cookies look fab Em. Pumpkin and ginger - I am sold. I am a Mad Men fanatic - I own the first 3 series on DVD, and I just love it to death. Sure, I don't know the real names of all the cast like some people on Basket of Kisses (a blog dedicated to Mad Men), but I don't watch it for that - I just love the fashion, the elegance, and the witty dialogue, even if most of the characters are not such nice people. Also those cookies look awesome! Mmm, these sound addicting - yum! My husband loves gingersnaps, so I'm sure I'd get some brownie points if I made some of these for him! The new design looks awesome. Congratulations on conquering HTML! I love, love pumpkin too. 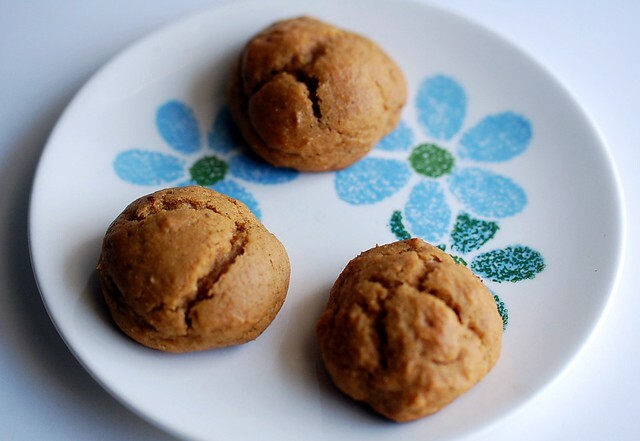 Great idea adding the pumpkin to the gingersnap cookie. Congrats on figuring out the columns! Holy cow, these are delicious! It is taking alllllll the self control I have to not eat the whole batch!